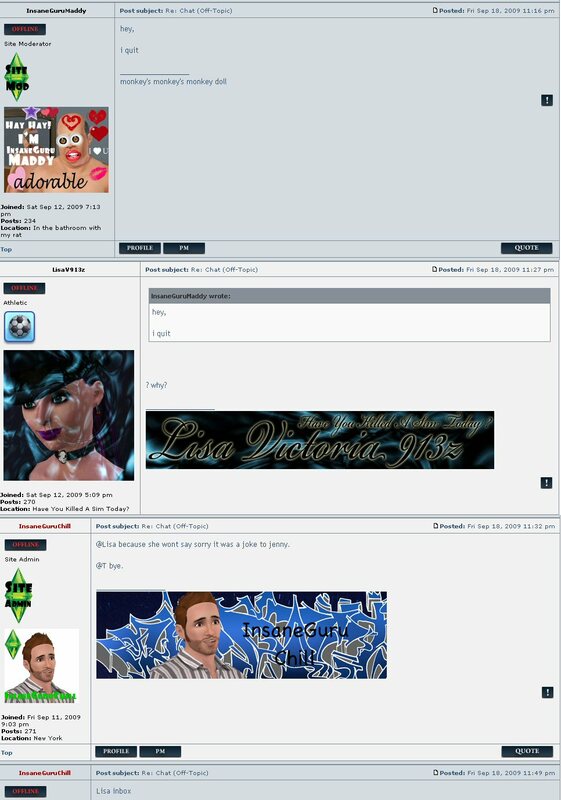 The day of the ‘official launch’ for the InsaneSims board, run by InsaneGuruChill (aka Sims3Rich) was as we all know an eventful one, but the drama that occured earlier in the day has been somewhat shrouded in mystery, speculation – and mass deletion of the evidence by InsaneGuriChill/Sims3Rich. 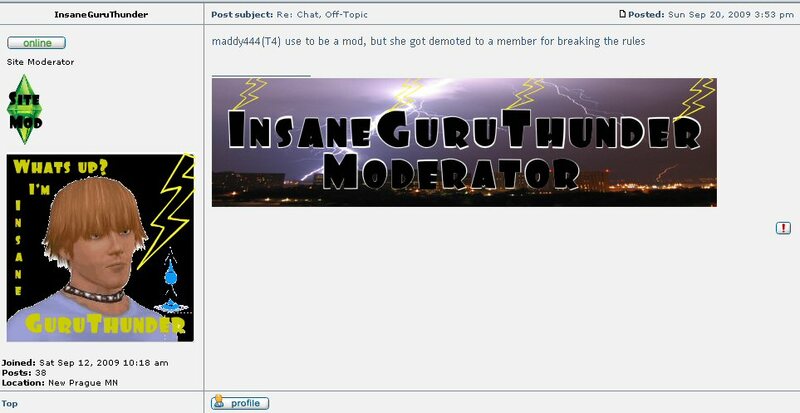 Doubtless his enemies on the Simaniacs board will mutter ‘par for the course’, but to others anxious to know why Maddy444 has yet again found herself on the receiving end of a ban – indeed from a board she was a moderator of – we need to cast our eyes to the events of Friday 18th September. 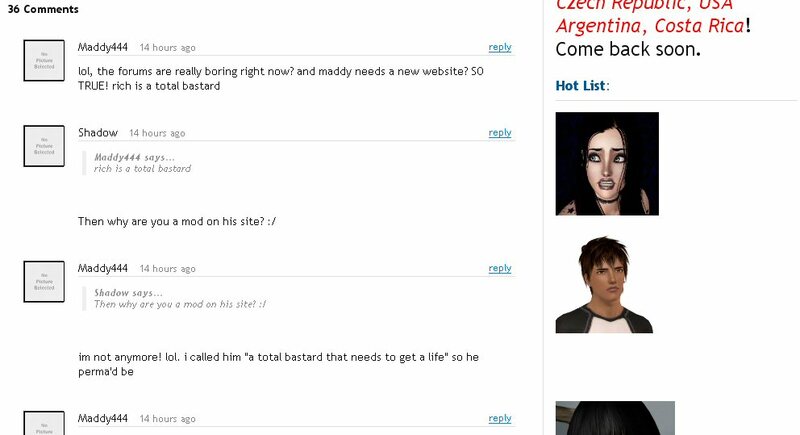 Maddy444 it seems had used the PM system on the new site to send a message to one member Jenny, who had not posted. 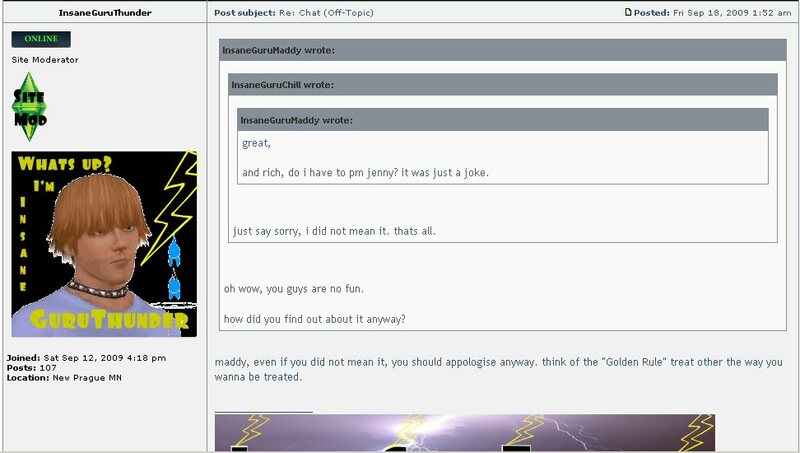 Whatever was said, the gist is Jenny was not at all pleased and complained to InsaneGuriChill/Sims3Rich about it. Now it has to be said that this is all pretty bad form all round. Moderators should never, ever, start having public arguments with one another on their own website (hence why many have a private ‘staff only’ section). By this stage, with tempers flaring, that really ought to have been the end of it. To be blunt, considering this was all about PMs in the first place, perhaps it might have been a good idea to restrict communications on the topic to PMs as well, instead of airing their dirty linen out to dry? For Maddy444’s sake, as events proved, perhaps though it was lucky that this did happen. 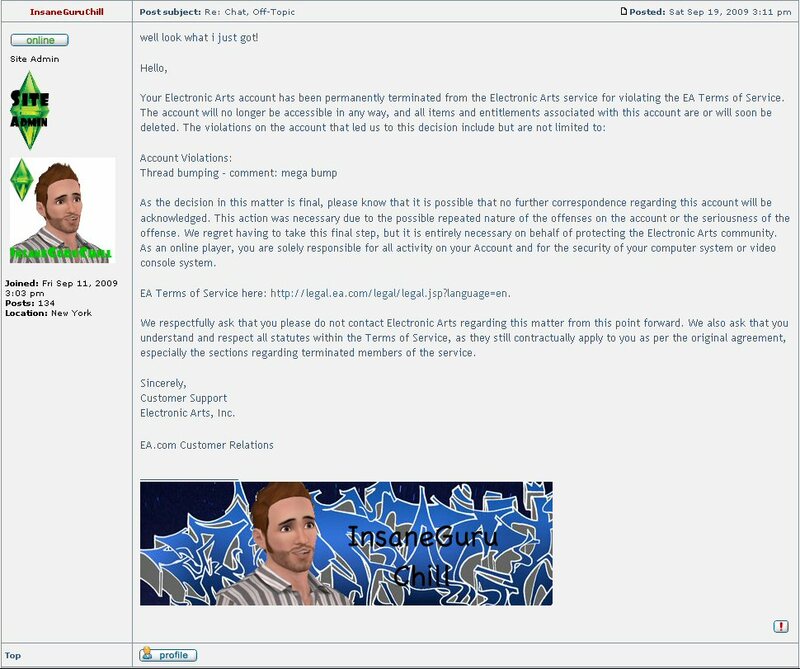 Elsewhere, the news at Shadow’s perma-ban from the EA boards (as previously noted, the second Sims game in a row he’s been expelled for good for his behaviour – you’d think he’d have learned) was the cause of a rather surprising reaction from InsaneGuriChill/Sims3Rich, inviting him to come and join. And that was that. So it seemed. 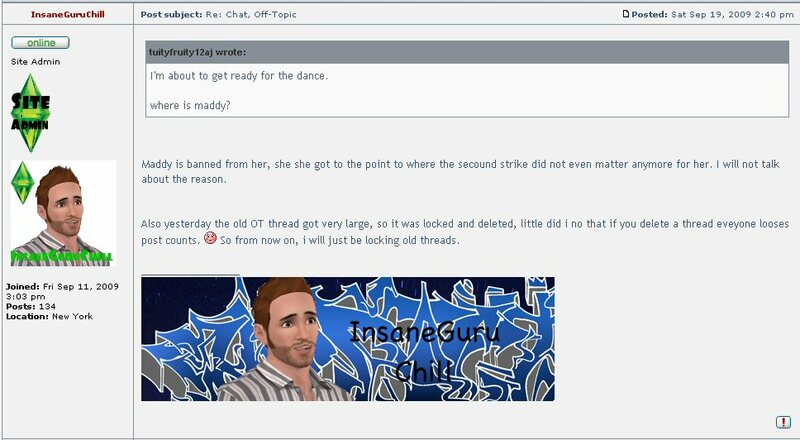 Maddy444’s obstinancy may be grating, but it is hard to disagree that she did have a point that this was Big Chief InsaneGuruChill indulging in a bit of powertripping over his minions, and the manner in which he was making such an enormous issue over the affair was utterly absurd. And did Walden95 resign? Did he hell! Another kick in the teeth for Maddy444 from her so-called friends – not been having the best of times of late, has she? "Are you Aarin in disguise? Are you A-a-rin in dis-guise? Are you Aarin, are you Aarin, are you Aarin in disguise?" How is everyone today CZ? Oh having a great time being talked down to like you're their schoolteacher, you patronising little s**t! Not that you're having a power trip gloat about it or anything, of course. 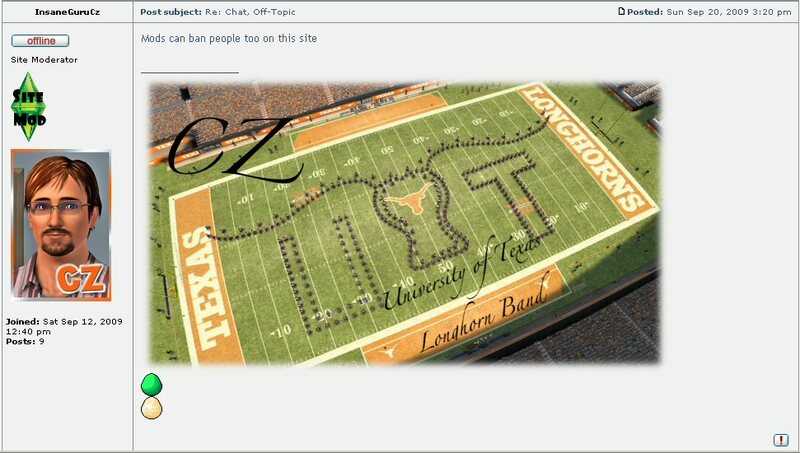 After InsaneGuruChill created this Forum Signature for his minions to put on their EA accounts? Wow! 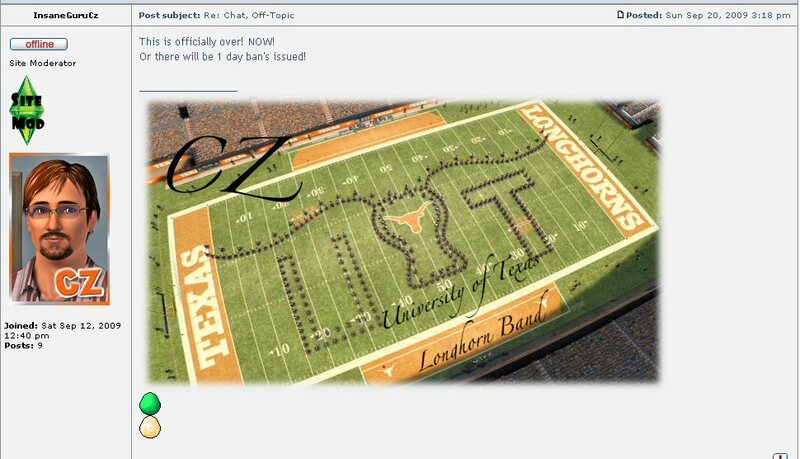 What an impressive forum signature! Must have taken them all day to make it! 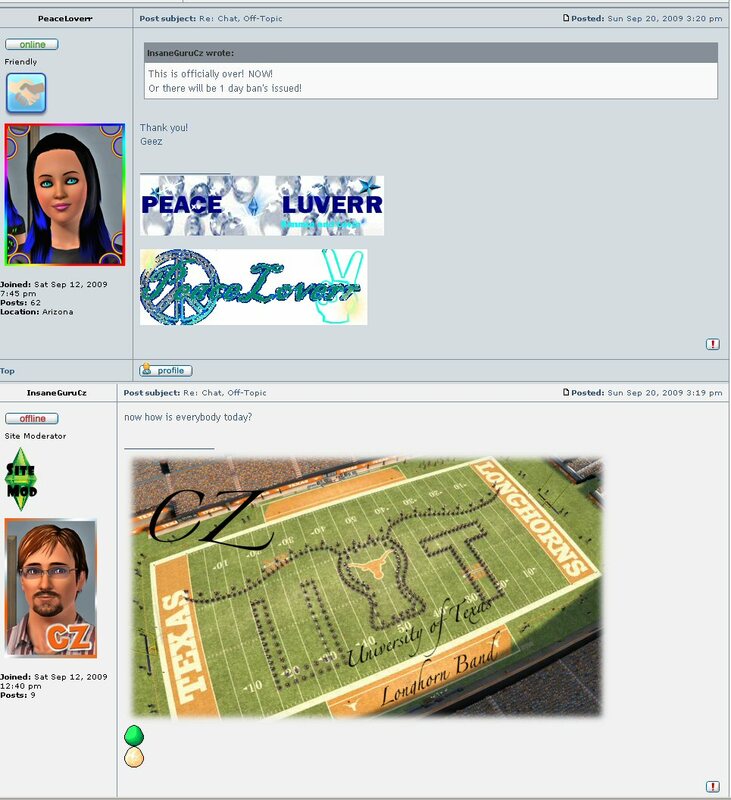 Shades of Aarin making signatures for her devotees to sport to demand her righteous reinstatement over at the official forum. Megalomania never changes does it? 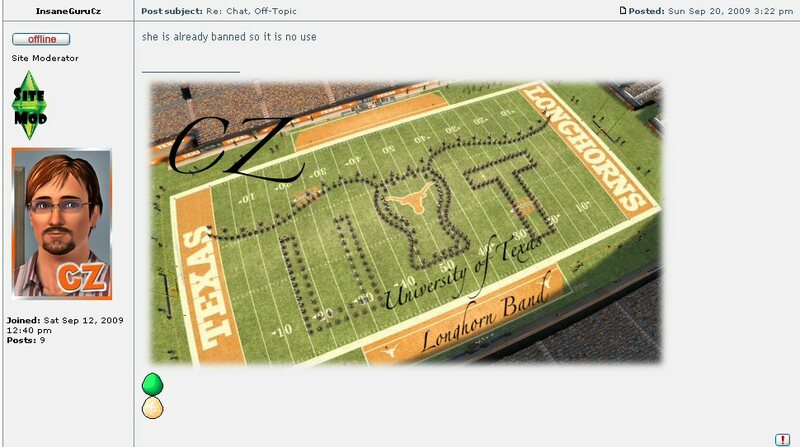 And what’s that little bit about only banning people who really deserve it? "Is it about me?" Well, duuuuuuuuuuh! 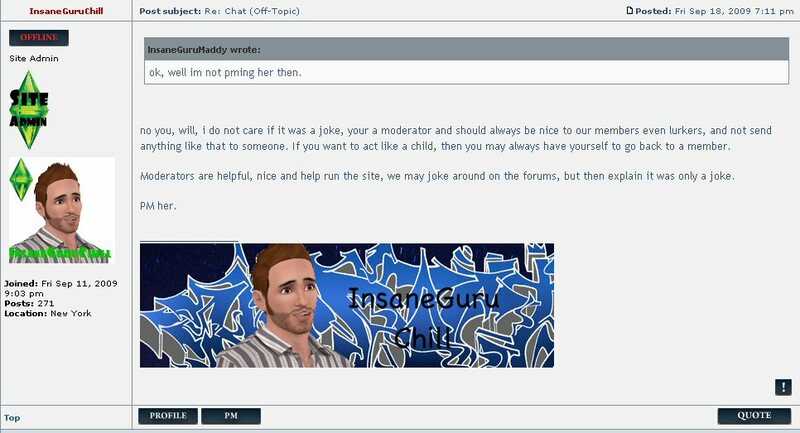 And with that concludes our investigation into Maddy444’s latest kick in the teeth, this time from people supposed to be her mates. She now appears to have vanished online, apart from appearing to register over at Jazz-Hands – twice – but has failed to post anything to date. One wonders if she’s now had enough of the Sims world. We at The Mare’s Nest for one hope not. Though we may have at times not agreed with her, she has proven to be one of the decent individuals and often the victim of circumstance. There will be other boards awaiting her, and hopefully a return to the EA board in due coarse. As for those currently in charge of InsaneSims, we fear the worst. 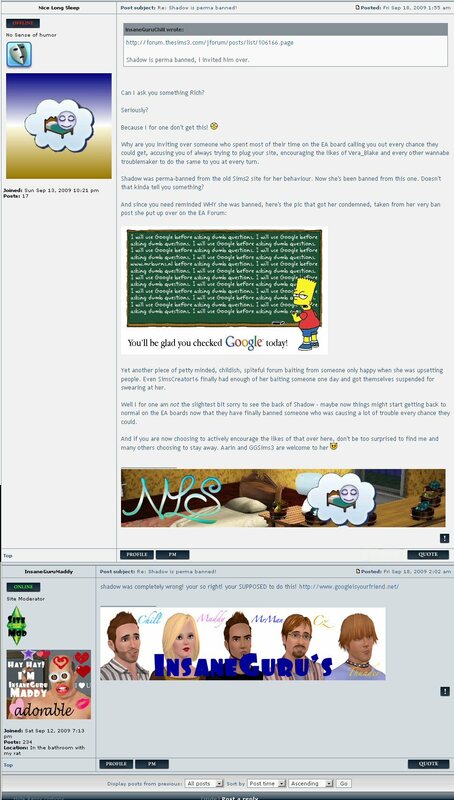 Once the tea and sympathy for Sims3Rich’s ban wears off, and the ideosyncratic campaign by a small gang of former Forum bullies victims trying to be ‘bad asses’ on its behalf loses momentum (the administrators aren’t even bothering to ban anyone it seems this time, just letting the threads suffer the indignity of being buried), then all it will take for the InsaneGurus to take out their bad day at school or work out on their adoring public for it all to go pearshaped. They have already lost two members out of it: not just Maddy444, but Nice Long Sleep – one of the more active of the early members – has not been seen since. 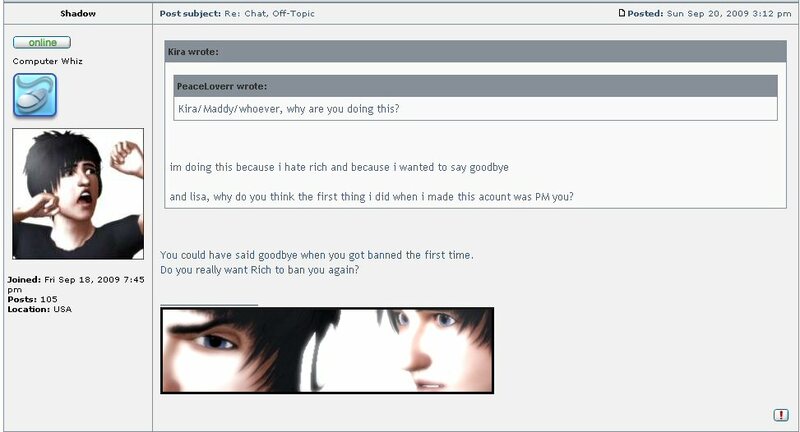 Probably Sims3Rich feels he can afford to fall out with a few members when membership of the forum has more than doubled in the aftermath of his ban for spamming (something his members are now trying to say on the EA forum is not a bannable offense, even though Sims3Rich printed on the InsaneSims board that this was the reason they banned him!). 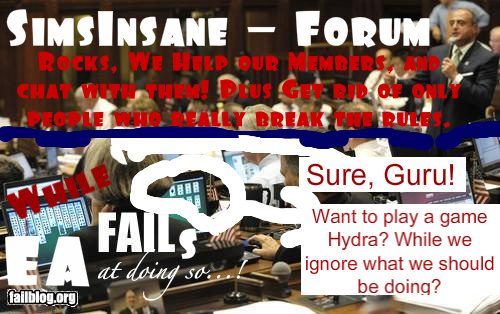 It is a foolish forum moderator who believes there is an inexhaustible supply of active members ready to replace those friendships they bust. Karl Marx once said, ‘History repeats itself, the first time as tragedy, the second time as farce.’ If the experiences of Jazz-Hands and now InsaneSims are anything to go by, he was just about right. 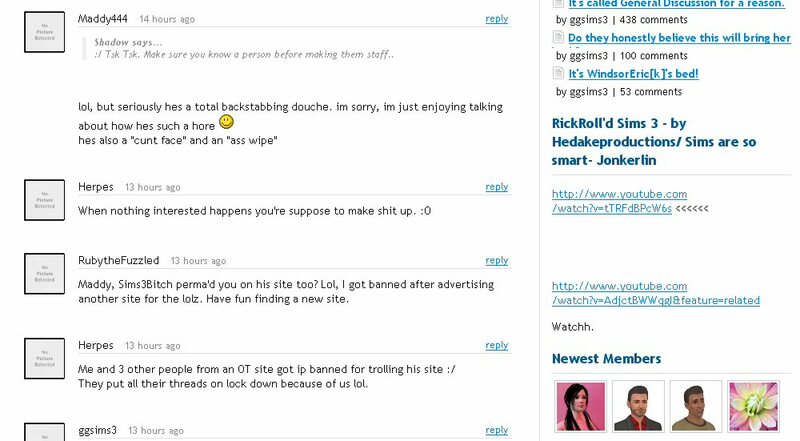 Straight from the horse's mouth - "banned for thread bumping"